Much as I love my morning bike commute, when it’s already in the 80s by 6 a.m., with humidity levels worthy of a tropical rainforest, and highs for the day close to (or over) 100 degrees – it takes an act of will to hop on the bike. It’s best if I can hit the path before 6:30 – but that’s not always easy. Despite my distaste for being overheated, I’ve found my rides these past two weeks tolerable. I dress lightly, drink water, and try to stay in the shade. Last Thursday morning I had a treat – courtesy of the National Park Service. When I reached the plaza in front of the Lincoln Memorial, there was a large sprinkler set up on a tall pole, sending a cascade of relief to the overheated. Not only did I head right for it; I made an extra loop around the circle of cool showers before riding the last two miles to work. But that turned out to be a one-off. Summer heat gets me thinking about what I wear on my bike. I’ve read that many bike advocates want to “normalize” biking as a form of transportation by wearing regular clothes on their bikes. But for my 10-mile commute, which includes hills, even on relatively cool days I’m quickly drenched in sweat. I sometimes see men riding to work in business suits, women in dresses and, frankly, I don’t know how they do it. Virtually everyone on the bike paths that I use for commuting wears sports attire. If the temperature is chilly enough that I would not get sweat-soaked, then it would be too cold to start my ride without thick, wind resistant, tights and jacket. I’m not trying to look like an elite athlete (that would be a joke). I’m just trying to be comfortable! Lately I’ve been fantasizing about getting cold on my bike. For these excessively hot days, a moisture-wicking top, bike shorts, and my Keen sandals are just about all I need. Well – sunglasses, fingerless bike gloves (even my hands sweat in this weather), and I-phone, which I now set to Pandora – having grown weary of all my existing playlists. When it’s this hot, cotton is impossible. There was a recent article I read about how to dress for biking in the rain. What a laugh for those of us in the heat blistered east. It was all about wool garments and staying warm. Another recent article reported on a study conducted in D.C. several years ago – analyzing which workplace amenities increase bike commuting. While providing bike parking helped – the biggest increases in bike commuters were at worksites that have shower facilities. I am lucky to have this benefit. It would be tough to face my commute without the chance to clean up before work. Yet some Twitterers scoffed at the need for showers. How do they not get it – climate makes a difference! I’ll close with a happy moment from Sunday morning. Biking to yoga, despite the drizzly weather, I saw a family out on their bikes – dad on a cargo bike with two tots in the front bucket – mom and older child on their own bikes. It was the first sighting of a cargo bike in my Arlington, VA neighborhood, and I smiled and gave them a big “thumbs up.” I’ve come to the realization that hauling groceries on my beloved commuter bike is not ideal, so I’ve gone back to using the old heavy hybrid for shopping, which is stable, even with two fully loaded panniers. But I find myself attracted to cargo bikes and wonder what’s happening to me. I’m sitting in the Bangor airport, the beginning of my transition from 2 weeks of writing and riding to my “real” life back home. I’ve become accustomed to cool nights and mornings, scented of pine. My routine these past two weeks revolved around a daily ride on my rented “comfort” bike, from a small cottage just a stone’s throw from the rocky Maine coastline, to writing classes on the campus of the 350-student College of the Atlantic, which hosted the Johns Hopkins summer writing program. It was easy to get used to riding on the relaxed streets of a quiet tourist town, with little traffic and congenial, accommodating drivers. I enjoyed the rhythm of grocery shopping, a little at a time, with my one pannier– somewhat precariously attached to the back of the bike. 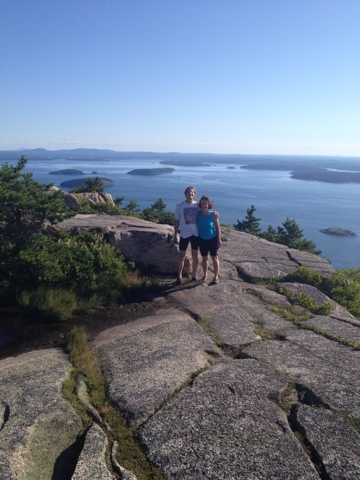 But the real highlight was having a weekend to explore Acadia National Park by bike. My cottage was just about a mile from the park entrance. The boyfriend flew up for the second half of my school/vacation – so I had a companion to explore the park with. On Saturday, we focused on Acadia’s some 45 miles of carriage roads – wide gravel paths that are completely off limits to cars. While many areas are relatively flat, there are plenty of hills, and my thighs definitely got a workout! For a photo of these trails, see the NYTimes blog (http://green.blogs.nytimes.com/2012/07/06/making-way-for-more-bikes-in-national-parks/?ref=nationalparkservice),which appeared in a post last week that discussed making the national parks more accessible to bikes (yay)! While the weather was hot for Maine (in the 80s during the day) it was a welcome respite from the DC-area’s sweltering 100 degree + heat wave. Still, it was frustrating that most of the park’s glistening lakes, liberally sprinkled throughout the park, prohibited swimming. It’s possible that we breached that rule in some small and inconspicuous ways. Dense forests shaded most of the paths, and the granite mountains that towered impressively above were a refreshing change of pace from my usual urban environs. The long slog up and out of the park along the western edge of Cadillac Mountain was followed by the reward of an exhilarating long ride down Eagle Lake Road. It’s rare for me to get a really long, brakes-free flight downhill. I crouched forward, attemptingto make my position somewhat more aerodynamic on the “comfort” bike, and was nearly shouting with sheer joy. What a rush! Sunday we left the cottage at 6 a.m., intending to focus on the 20-mile Park Loop Road. But shortly into our ride, we stopped to hike The Precipice – a challenging and somewhat fear-inducing rock climb about a mile and a half straight up the edge of a mountain, aided by sturdy iron rungs and ladders. We were feeling a bit prideful of our 60-something fitness level, until we saw a man who looked to be in his 80s striding easily up the trail. We resolved to return in 30 years and do it again! Back on the bikes, we made our way to the one sandy beach in the park, where I gleefully dunked myself in the ocean’s chilly northern waters – just long enough to cool off. Staying in my wet bike clothes, we made our way around more of the Loop Road– long slogs up the mountains followed by swift glides down. Another dip in the “Bubbles” lake and a repeat rush down Eagle Lake Road were a happy end to a 10-hour day of outdoor exertions. Wednesday afternoon we had one last opportunity to visit Acadia, this time focusing on climbing the Beehive – another rock climb, this one much shorter, but with more stretches that skirted the narrow edges overlooking sheer drops, with no iron hand-holds for security. But this time, instead of descending the way we went up, we more reasonably took the alternate path down, an easy hike that ended at The Bowl – a lovely small lake – finally one legally sanctioned for swimming. Our final stop was a hike down from the Schooner Road overlook, where I tried to find the anemone cave I remembered from a childhood visit. The cave is no longer marked – a precaution against too many visitors destroying the fragile setting. We were unable to locate it. Maybe the tide was too high, or maybe we didn’t try hard enough, as we had to get the bikes back to the rental shop before closing. I’m left with the contrasting images of enduring mountains and fragile wildlife, all surrounded by the oceans, with their ever-changing tides. I tucked a few stones and pinecones into my bag– hoping they will reassure me that the rejuvenating wonders of the wilds are still available. It’s up to me to make time for them. June 27, 2012 – What’s so Funny ‘Bout Peace Love and Understanding? Lately I’ve been reading about cyclists’ run-ins with rude, aggressive, or oblivious drivers. I even blogged about my own recent mishaps. Many have chimed in that the majority of their riding experiences are positive – a sentiment I share. Among the myriad reasons that I bike, my favorite is the smile it puts on my face. Nevertheless, it can be a challenge to free ourselves from an “us versus them” mentality when we’re on our bikes. Those of us who bike for transportation contend with an often-hostile environment that is rarely designed for the needs and vulnerabilities of the pedal-powered. I try to bike safely and considerately – whether I’m on the bike path, in a bike lane, in traffic, or – when all else fails – on the sidewalk. Even so – given the vagaries of urban biking, I understand why cyclists do some of the things that tend to infuriate both pedestrians and motorists (and even, sometimes, other bike riders). First of all, there’s something about the psychology of riding. Maybe it’s even physics – some variation of Newton’s law about a body at rest remaining at rest and a body in motion remaining in motion. We want to remain in motion or, when that’s not possible, at least stay perched on our seat, both feet on the pedals. There is some primal resistance to stepping down. Yet those cyclists who refuse to stop create a dangerous, and frightening, hazard – weaving in and out of traffic, disregarding red lights, passing unsafely on narrow paths. So what’s the solution? How can we establish peaceful coexistence among all of us – absent my fantasy of waking up to discover that complete streets and broad, well-maintained paths miraculously sprang up overnight everywhere? When drivers and cyclists see each other as enemies, it’s easy to vilify each other and consider ourselves morally superior. I’d guess that many of us who make a lifestyle choice to ride bikes think, at least a little bit, that we are better stewards of the environment and more physically fit than the car-bound, yet feel that we are underappreciated (if not viscerally hated) by the public at large. Perhaps, being part of a minority group, we hunger for the social cohesion we find among the like-minded. But what does this sense of superiority get us? The other day, as I was stopped on my bike attempting to cross the GW parkway at the crosswalk, a runner beside me became enraged when car after car zoomed by in the rush hour traffic. While it often takes a few minutes until the cars in both lanes of traffic stop, it’s just a small inconvenience; surely nothing to lose one’s cool over. But let’s face it: we live in a “me-centric” culture. Most of us want what we want and we want it now. I’m just as guilty of succumbing to annoyance at the obliviousness of tourist hordes, lines of segways (grrr) in the bike lane, or fast riding bikers who don’t bother to warn when passing. I try – not always successfully – to bring my yoga practice into these moments. I recently read: “Holding on to anger is like drinking poison and expecting the other person to die,” a quote attributed to the Buddha. Maybe we need to bring a little old fashioned “petal power” to our “pedal power” – and just enjoy the fact that we have bikes to ride, bodies that are strong enough to ride them, places to go, and things to do. Some years ago, when I got the vanity plates YOGINI on my car, I became very conscious of my driving. I felt that, if I was arrogant enough to proclaim myself a yogini, my considerate driving should be a reinforcing message about the transformative value of yoga. Knowing that many bike riders aren’t exactly poster children for good citizenship, I feel that it’s important for me to be a good bike riding role model: to (at least mostly) follow the rules of the road when I’m riding in traffic, always politely warn when passing on the multi-use paths, and – when there is no safe alternative to riding on the sidewalk – ride slowly, yield to pedestrians, and thank them when they are kind enough to move aside. My thought is that the nicer we are and the happier we seem when we’re riding our bikes, the more the grumpy people stuck in their cars will consider the two-wheeled alternative.